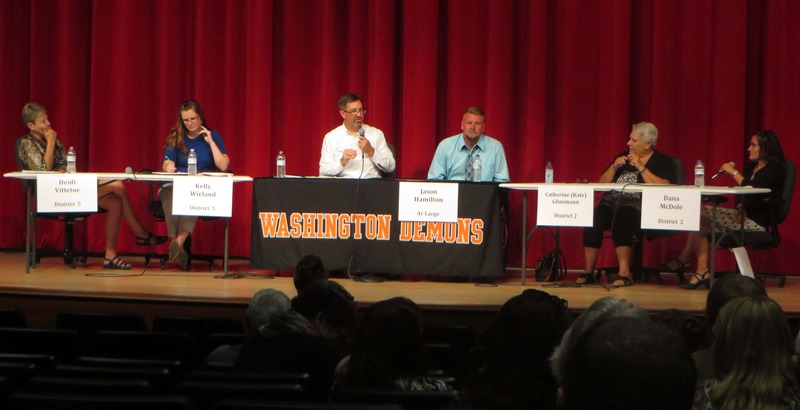 Funding, open enrollment, facilities, open communication, partnerships with the community, and retaining quality teachers were all discussed at Wednesday’s Washington School Board candidates forum. The event at the Washington Area Performing Arts and Events Center sponsored by the Washington Chamber of Commerce began with each candidate giving opening remarks. The At-Large candidate Jason Hamilton went first since he’s running unopposed. Then Ed Raber moderated a question and answer session with District 2 candidates incumbent Dana McDole and Kate Glinsmann, as well as District 5 incumbent Heidi Vittetoe and Kelly Wieland. 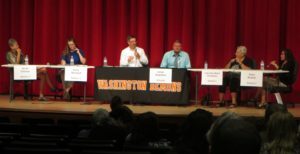 Visit KCIIRadio.com to hear a Washington Page with each of the five candidates. Everyone in the school district can vote for every district representative. Election day is September 12th, listen to KCII that evening for live results from the Washington County Courthouse.